Drawing on the objective visual language of maps, charts and diagrams, How to Draw Charts and Diagrams explores the ways in which subjective meaning can be made through an intuitive and layered ‘crypto-cartography’. Through a capricious, subjective plotting of space, the drawings provide an intuitive map to help navigate a collection of disparate and paradoxical ideas. The works draw on a range of tangential visual references from topographical contour maps, weather charts and cosmological imagery, scientific and occult diagrams to sketchbook annotation. In the works on board, suffused, nebulous spills of ink and gouache are consciously composed within fields of white. The abstract, organic pools are tempered and organized by sprawling, probing linear forms which classify their formal qualities, boldly categorizing areas of tone and colour. Assertive and tentative by turns, these linear shapes are used to examine and dissect in a manner inspired by the aesthetic of a shaded area map, in which colour values and segmented space hints at the possibility of a correspondent order. In such maps, a key or legend is provided to aid the viewer in discerning meaning from the graded tones and colours; within the works in this exhibition, however, logic is self-generated and the mapping process itself is performed in intuitive response to the surface. Unlike functional maps, the value and meaning of areas have no external reference but serve as a physical ground on which the proximity of ideas can be charted and played with. 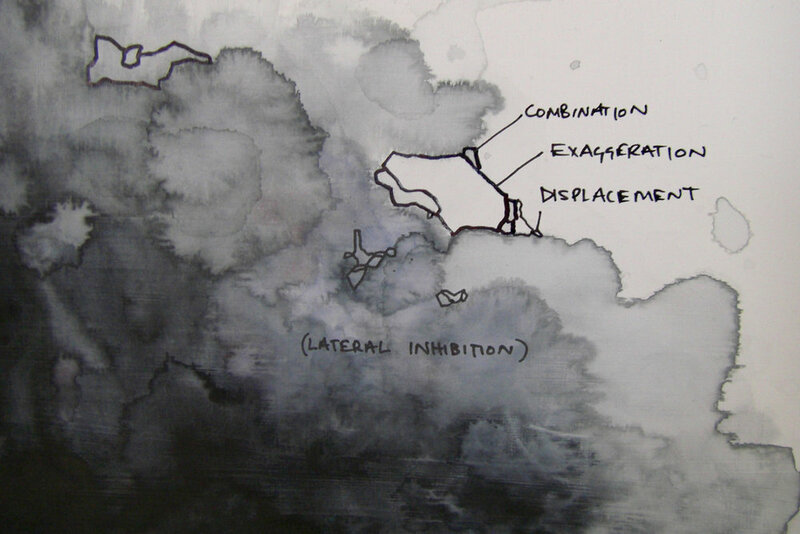 This impulsive plotting of space is enacted on the walls of the gallery as well, setting up a relationship between the maps on board and the space of the exhibition, an evolving relationship that shifts with the spread of this arbitrary wall-map. Across all of these formal, abstract fields, a capricious accrual of paradoxical and disparate ideas is played out. Fragments of text annotate the linear forms, each taken from real world sources like indexes or listings, headings, footnotes or titles and each with a reference elsewhere. Sometimes playfully self-referential (readable writing/abstracting services), sometimes jarringly incongruent (catharsis/proofreading) or contradictory (quantitative discrimination/qualitative discrimination), these pillaged fragments of text are reorganized into new relationships throughout the works, their proximity and association allowing new and unexpected narratives and poetic resonances to be made. In parts, disparate terms are also transcribed with carbon transfer paper from discrete blocks of text found in magazines or newspapers, ideas drawn out and once again re-contextualised into a new order. Sets of relations are formed between these words also, relations that belie the continuity and logic of their source and which tease out a new, internal logic. For all the arbitrary and intuitive processes that construct them, the maps and notations throughout How to Draw Charts and Diagrams all function with this system of internal and perhaps impenetrable logic, providing a space in which the interrelations of seemingly discrete notions can be assessed. The exhibition charts the construction of a non-hierarchical understanding of these relationships, and in making the disparate intimate, it might provide a sprawling, rambling record of the emergence of subjective meaning.